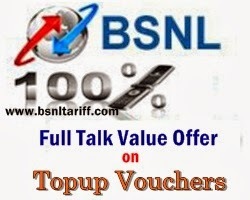 State run Telecom company Bharat Sanchar Nigam Limited (BSNL) has launched two promotional offers on different denominations Topup Vouchers for 12 days and 20 days in Prepaid Mobile Services across Andhrapradesh Telecom Circle for upcoming Festivals. The AP BSNL Competent Authority has announced Full Usage Value offer equal to MRP on CTopup (Easy Recharge) Topup Vouchers of Rs.55/- and Rs.110/- for a period of 12 days. This Full Usage Value offer with effect from 24-10-2013 to 04-11-2013 (12 days). Second Full Usage Value offer equal to MRP on CTopup/Flexi Topup Vouchers from Rs.200 to Rs.990/- (in multiples of Rs.10). This offer is with effect from 24-10-2013 to 12-11-2013 (for a period of 20 days).